In Fiscal Year 1978, Amtrak began a program to convert cars purchased from the predecessor railroads from steam power to electric head-end power (HEP). Under the older system, a boiler in the locomotive heated water to create steam that was then piped throughout the cars to provide heating; lighting and air conditioning were supplied by a generator and batteries in each car. Head-end power used electricity generated by the locomotive to perform all of these functions. Heritage cars at Beech Grove undergo conversion to head-end power. 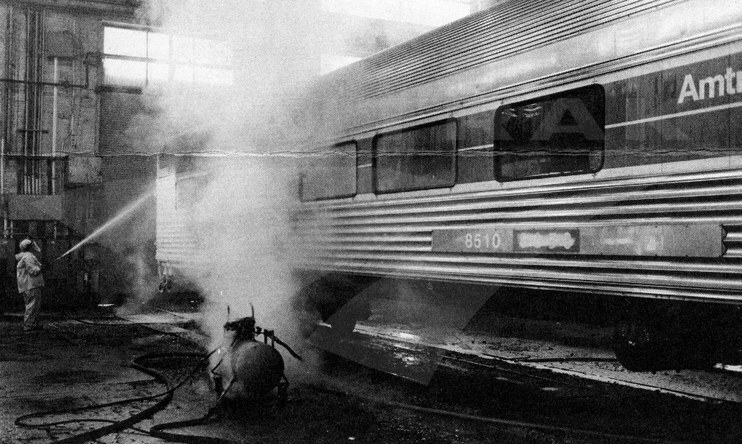 An article in the August, 1980, issue of Amtrak NEWS explained some of the issues with steam power: “Internal systems of pipes and wires progressively deteriorated and become increasingly unreliable, although, in many cases, the car structure itself was sound. Cars froze up in the winter and air conditioning failed in the summer with agonizing regularity.” Meanwhile, new equipment such as the single-level Amfleet cars and the bi-level Superliners were built with modern all-electric systems. To address this difference, Amtrak experimented with steam to HEP conversions under President Paul Reistrup. Work took place at the Beech Grove shops, the primary Amtrak heavy maintenance facility located southeast of Indianapolis. 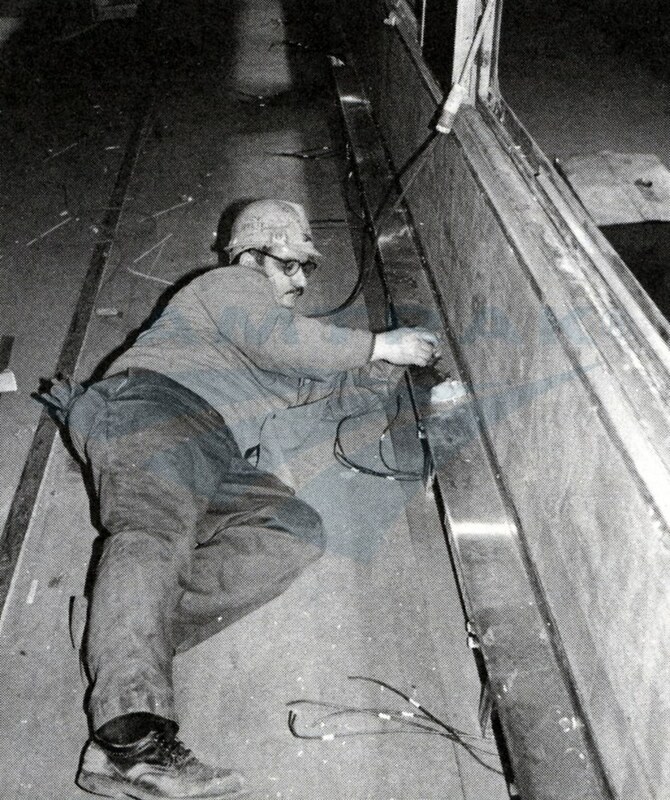 Crews focused on sleeping cars assigned to the Night Owl (Washington-Boston), Montrealer (Washington-Montreal), Cardinal (Washington-Cincinnati-Chicago), Inter-American (Chicago-Laredo/Houston) and other overnight trains that had recently gained Amfleet equipment. With the success of these upgrades, Amtrak leadership decided to make the leap and convert entire train sets to HEP. 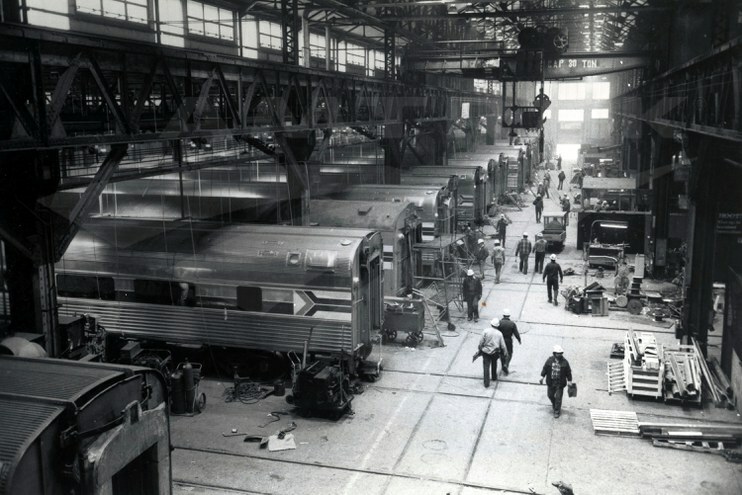 The first train overhauled was the Lake Shore Limited (New York/Boston-Chicago), which included work on coaches, diners, sleeping cars and lounges, followed by the Broadway Limited (New York/Washington-Chicago), Crescent (New York-New Orleans) and Silver Meteor (New York-Miami/St. Petersburg). Depending on the type of car, conversion cost between $250,000 and $400,000—versus about $1 million to purchase a new car. Amtrak completed the conversion program in 1982. A car was stripped both inside and out following fumigation. Wiring was removed and old steam lines and all exterior fittings except the air tanks were cut away. The empty car shell, ready to be fitted with new components, was cleaned with an acid-foam wash. In the above image, carman R.A. Bennett completes the washing. New exterior equipment was then hung below the car, including transformers, an air conditioning unit, distribution boxes, an emergency battery box, water tanks, a new plumbing system and a 480-volt electrical train line. 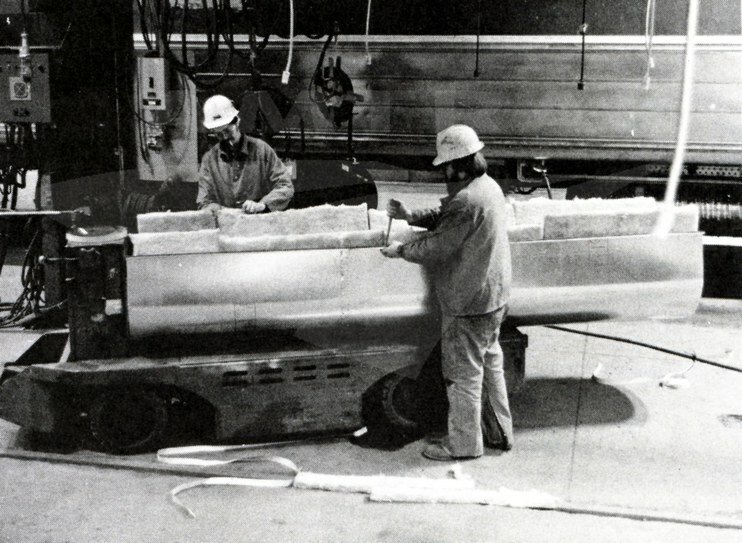 Above, top, carman Tom Leathers and carman-welder John Skaggs assemble a foam-lined jacket to cover and insulate a car's water tank. 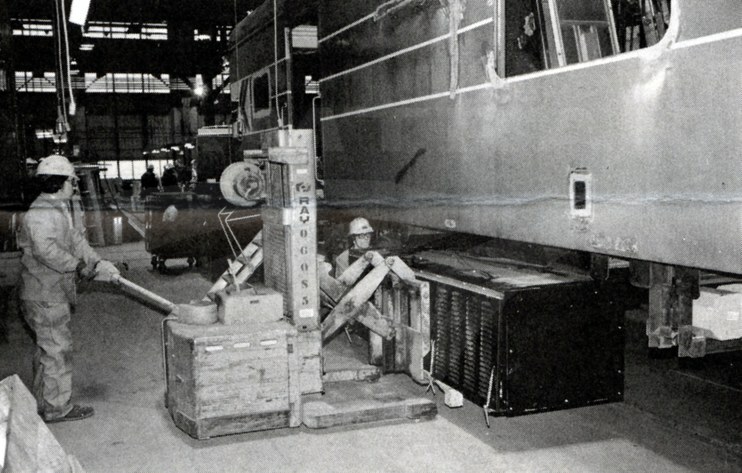 Above, bottom, Mike Baker and Jeff Bocock, carmen-welders, roll an air conditioning unit into place under a dining car. Crews moved the car to the coach shop where all new wiring was connected. Heating elements were installed along the floor—here performed by carman Dave Kern. In diners, all-electric kitchens replaced the original wood-burning stoves, thereby creating a much more comfortable work environment for the chef and cooks. Concurrent with the work mentioned above, the car’s trucks (wheel assemblies) were rebuilt using new and refurbished parts. 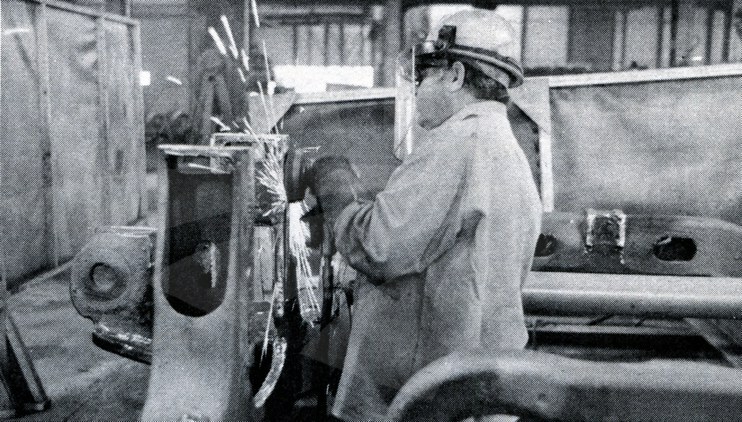 Here, carman Chester Hollis grinds down rough spots on a truck frame. The car was painted inside and out and branding elements such as striping and the Amtrak logo were applied. New windows made of a combination of glass and lexan (a strong plastic) were installed, as were carpeting and reupholstered seats. 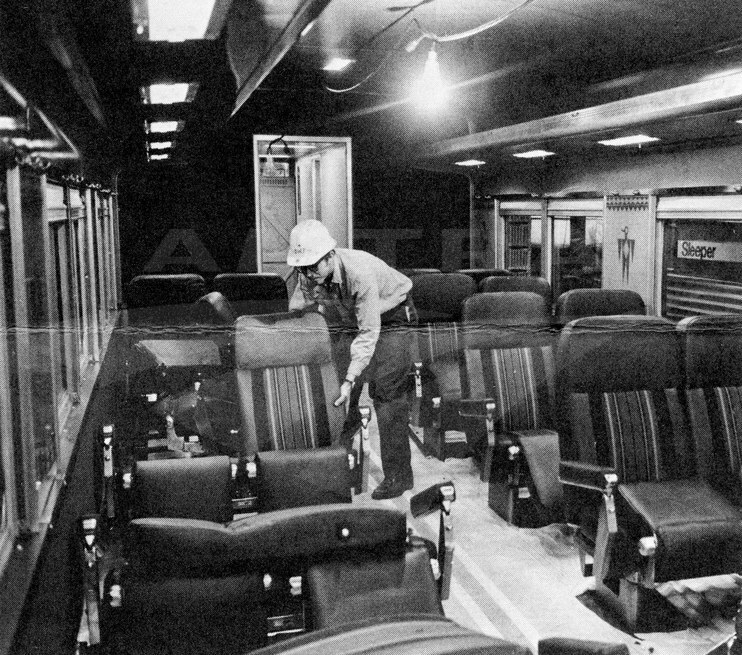 Above, carman-trimmer David Patton installs seats in a coach. The wall panels with Mimbreño-style birds indicate that the car once belonged to the Atchison, Topeka and Santa Fe Railway. Reworked trucks were set back under the car. The car underwent 48 hours of quality control tests before being placed back into active service. Many of these cars remained in service until replaced by the Amfleet II and Viewliner cars in the early 1980s and mid-1990s, respectively. Some Heritage dining cars are still used today on eastern routes, although they are slated for replacement as part of an order of 130 new single-level, long-distance cars being built by CAF USA. 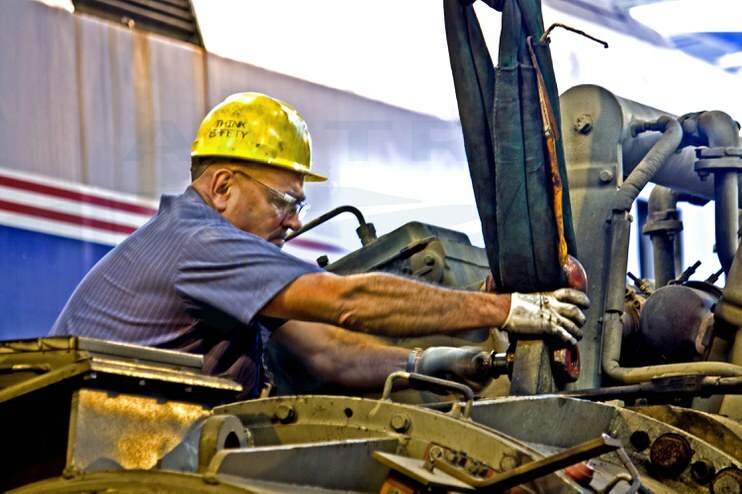 A Beech Grove machinist attaches a lift strap to a General Electric locomotive block. Produced 10 locomotive wheel sets (“combos”) for New Jersey Transit electric locomotives as part of fleet repair efforts after Hurricane Sandy. Read more about the history of the Beech Grove shops in this earlier blog post.